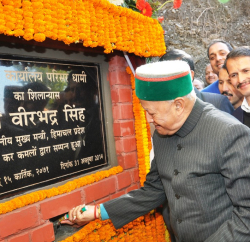 Fulfilling the announcements made on the occasion of Statehood day at Sunni, Chief Minister Virbhadra Singh today formally dedicated the Sub Tehsil Halog (Dhami) in Shimla district and announced Mini Secretariat at Halog (Dhami). He also laid foundation stones of Community Health Centre (CHC) at Dhami to be constructed at a cost of Rs. three crore and Science Block in Senior Secondary School, Dhami to be constructed at a cost of Rs. 16.33 lakh. Addressing a public meeting at Halog, Virbhadra Singh said that with the opening of Sub Tehsil, people of the area would be able to get their revenue works done nearer to their homes. He said that three bighas of land had been identified for construction of Mini Secretariat which would provide various facilities under one roof to the people as this was a centre place of various Gram Panchayats of the area. 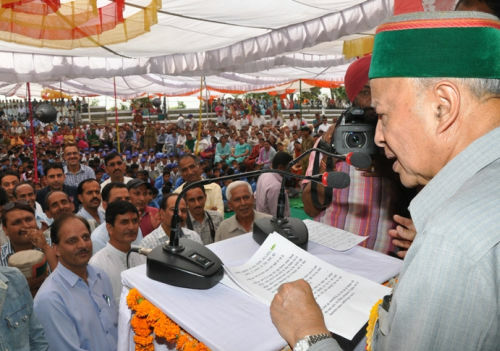 Virbhadra Singh said that State Government had adopted Election Manifesto of Congress Party as a Policy Document and efforts were being made to fulfill most of the promises in the first budget itself. He said that Government was working with a resolve of all round development of the State adding that all basic amenities would be developed upto village level so that Himachal Pradesh could emerge model State in the country in real sense. Virbhadra Singh said that a multi purpose sports stadium would be constructed at Kutasani the land for which had been identified. Chief Minister announced Rs. 10,000 for school children of GSSS Dhami who presented culture programme on the occasion. Chairman, Block Rural Shimla Congress Committee, Chander Shekhar Sharma expressed his gratitude to the Chief Minister for laying foundation stones of various developmental schemes amounting to about Rs. 10 crore in Shimla Rural Constituency in his first tour of two days. He also thanked for announcing Mini Secretariat at Dhami. Pradhan Gram Panchayat, Halog (Dhami) Kamla Pant welcomed the Chief Minister while Vice President Jagdeep Singh presented vote of thanks. Former MLAs Sohan Lal and Shonkiya Ram Kashyap, Chairman, Zila Parishad Chandreshwar Prasad, Advisor to CM, T.G. Negi, D.C. Dinesh Malhotra, S.P. Abhishek Dular, other prominent persons and senior officers were present on the occasion.